Develop an environment for students to prepare themselves to meet the challenges of the modern Information Technology industry and research by providing them ample IT skills, analytic bent of mind and proficiency in communication skills. Offer a unique and well-balanced programme consisting of courses that responds to the needs and challenges of the IT and research fields by providing both theoretical and practical exposure along with industrial training visits and research. Promote knowledge, analytical skills, professional ethics and creative thinking necessary for professional efficiency and life-long learning. Provide global exposure by collaborating with reputed national and international academic institutions. The Computer Science and Engineering Department of NERIST came into existence right at the inception of the institute in 1986. It offers a modular pattern of education with a unique combination of courses and projects that helps the students to cope with the recent advancements in the computer industry and information technology. The practical classes of Diploma Module and Base Module are held in this laboratory. 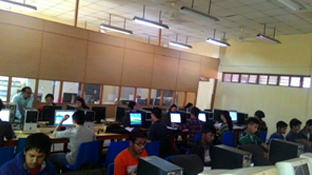 The students get exposure to various types of Application Software such as Visual Basic, C++, Visual C++, etc in this lab.